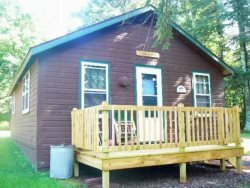 Enjoy this quaint recreational getaway located on beautiful Blockhouse Lake approximately 7 miles from Park Falls. Being located directly on a snowmobile/ATV trail makes this rental a must for outdoor enthusiasts. Wildlife is seen often! Relax with family and friends or take a cozy vacation by yourself to get away from the hustle and bustle of everyday life! Blockhouse Lake is 242 acres in size and is home to Muskie, Northern Pike, Largemouth Bass, and Panfish. The maximum depth is 8 feet. Fire pit - One bundle of wood will be provided. If you would like more, there will be an extra charge. Charcoal Grill ~ be sure to bring charcoal and lighter fluid!